This system is an inexpensive and flexible wireless web based controller for brewing, Sous Vide and similar applications. With homebrewing it was originally targeted for electric brew in a bag (eBIAB), batch sparging in a cooler and extract methods but has recently been expanded on the desktop to multi-vessel and pump/stirrer control. So, if you already have a propane system and looking to go electric or starting from scratch and looking for a way to control your setup this is an alternative. 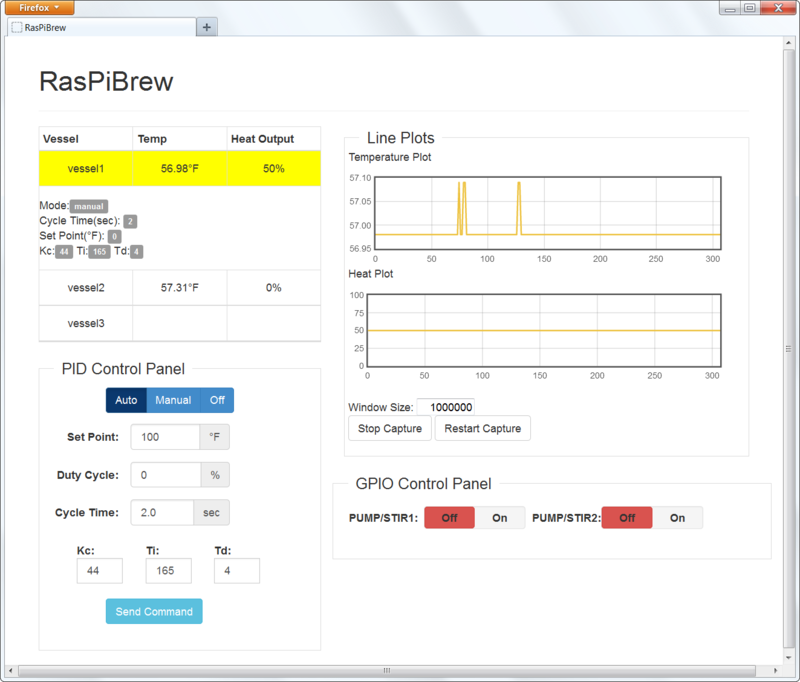 The most recent updates for this application are found on the RasPiBrew project page on Github. 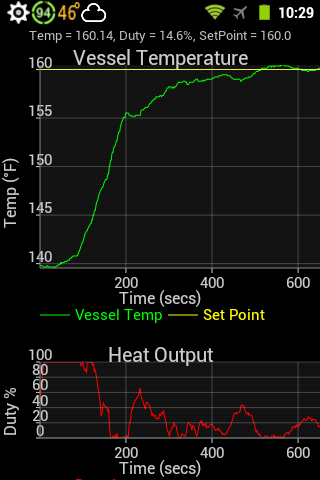 Using the Android Smart Phone App or a Firefox web browser the temperature of a vessel can be controlled with a Raspberry Pi . All status information including heat output percentage and current temperature are constantly sent back to the controller. 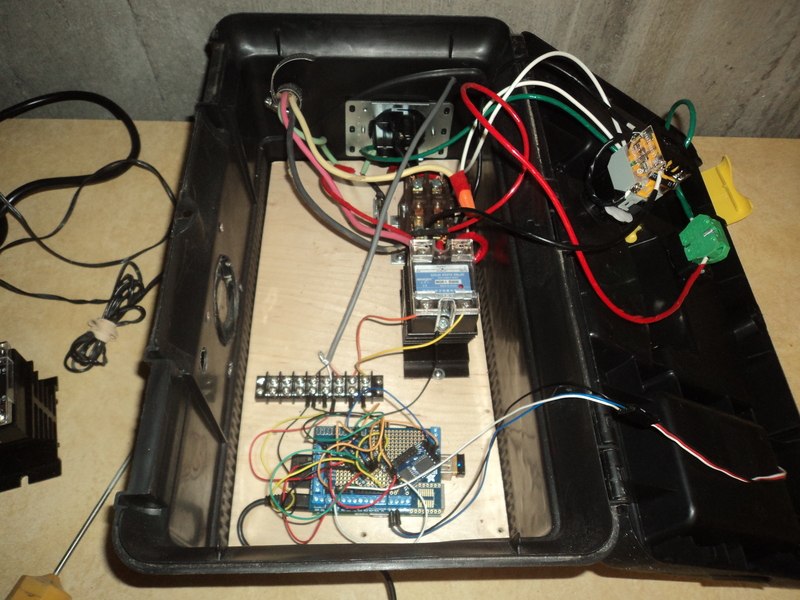 A very simple and inexpensive electronics hardware setup plus ease of use are the main goals of this project. No custom made boards that are specific for this project are needed. Also, using a web interface the level of customization is endless. Download Software for Raspberry Pi Web Server. 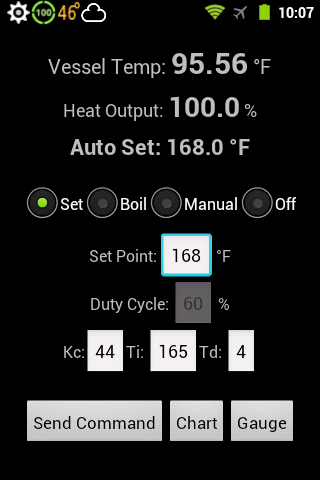 Also, Control and Monitor your vessel temperature and heat output with an Android app. Compatible with smartphones only. Optional: A Jeelabs Output Plug can also be used to drive more relays but requires software modification. Next, solder headers and connect everything together using wire jumpers according to the above schematic. Download the raspberry pi operating system: Raspberry Pi Downloads Use Win32DiskImager to install onto SDCARD. Run sudo setupcon once manually after the keyboard is setup otherwise you may have long boot times. with the correct ssid (router name) and wireless_key_passphrase. Copy software to /var/www preserving the directory structure. At the command prompt type: 'sudo nano /boot/config.txt' At the bottom of the file add the line: 'dtoverlay=w1-gpio' Save the file and then reboot. Replace the temp sensor id in config.xml with the id of your DS18B20 temperature sensor found in the /sys/bus/w1/devices/ directory on the Raspberry Pi. After creating a project and adding all source files, right click on project name. Select Publish and then Run Web Development Wizard... 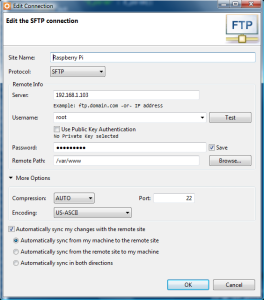 Select FTP/SFTP/FTPS and fill out the form as shown: Everytime files are saved on your computer they are automatically sent over to the Raspberry Pi. The language for the server side software is Python for rapid development. The web server/framework is web.py. Multiple processes connected with pipes to communicate between them are used. For instance, one process can only get the temperature while another turns a heating element on and off. A third parent temp control process can control the heating process with information from the temp process and relay the information back to the web server. On the client side jQuery and various plugins can be used to display data such as line charts and gauges. Mouse overs on the temperature plot will show the time and temp for the individual points. It is currently working in a Firefox Browser. The PID can be tuned very simply via the Ziegler-Nichols open loop method. Just follow the directions in the controller interface screen, highlight the sloped line in the temperature plot and the parameters are automatically calculated. After tuning with the Ziegler-Nichols method the parameters still needed adjustment because there was an overshoot of about 2 degrees in my system. 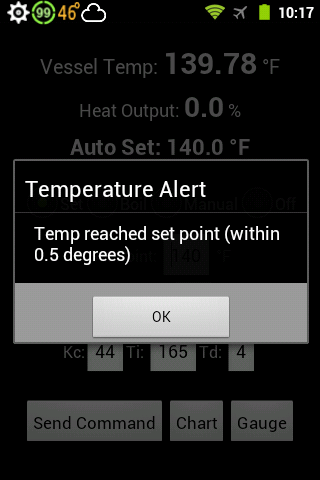 I did not want the temperature to go past the setpoint since it takes a long time to come back down. Therefore, the parameters were adjusted to eliminate the overshoot. For this particular system the Ti term was more than doubled and the Td parameter was set to about a quarter of the open loop calculated value. Also a simple moving average was used on the temperature data that was fed to the PID controller to help improve performance. Tuning the parameters via the Integral of Time weighted Absolute Error (ITAE-Load) would provide the best results as described on van de Logt’s website above. The electric brewery web site has great information on brewing hardware setup: http://www.theelectricbrewery.com/ The following sites are good sources for parts: bargainfittings.com, brewhardware.com and brewershardware.com. First, a GFCI protected outlet is needed as well as the correct wiring gauge for the amperage used. An electrician should inspect the wiring. 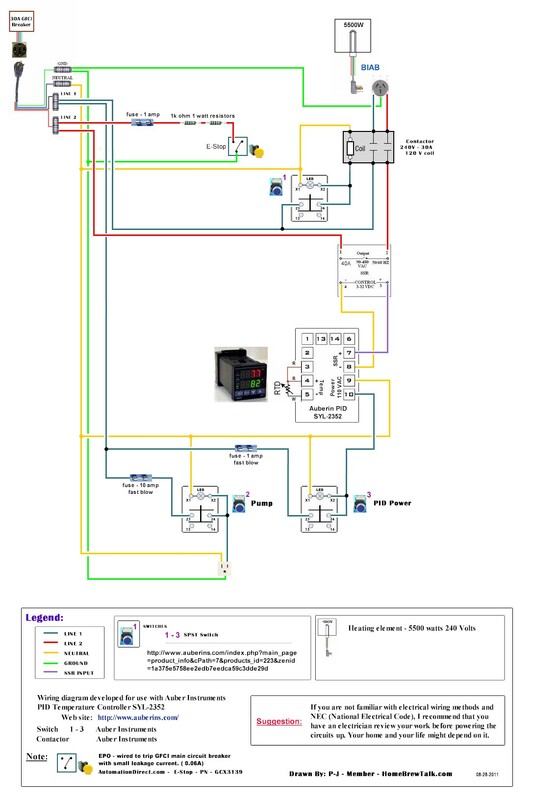 The following schematic (from PJ on homebrewtalk.com) is what I followed for my system which uses a 15.5 gallon vessel. 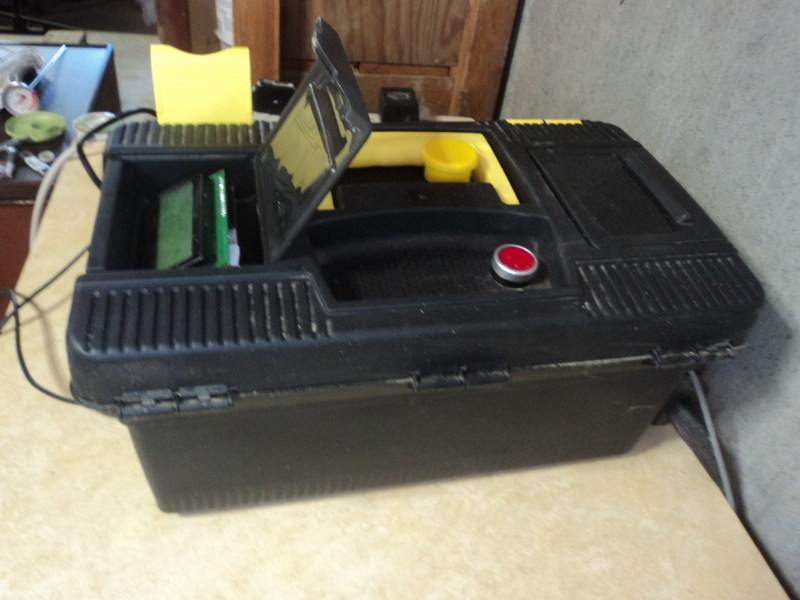 I replaced the Auberin PID with the RasPiBrew setup and the pump is not used. Instead, an ice cream maker motor attached to a stainless steel dry wall mixer is used to constantly stir the water or wort in the brew kettle. Otherwise, a temperature differential will occur above and below heating element. The pump or stirrer can be added to RasPibrew control with some software modifications and using the optional jeelabs output plug which can control up to 8 relays. Since I just turn it on and let it run, I didn’t think it was needed. 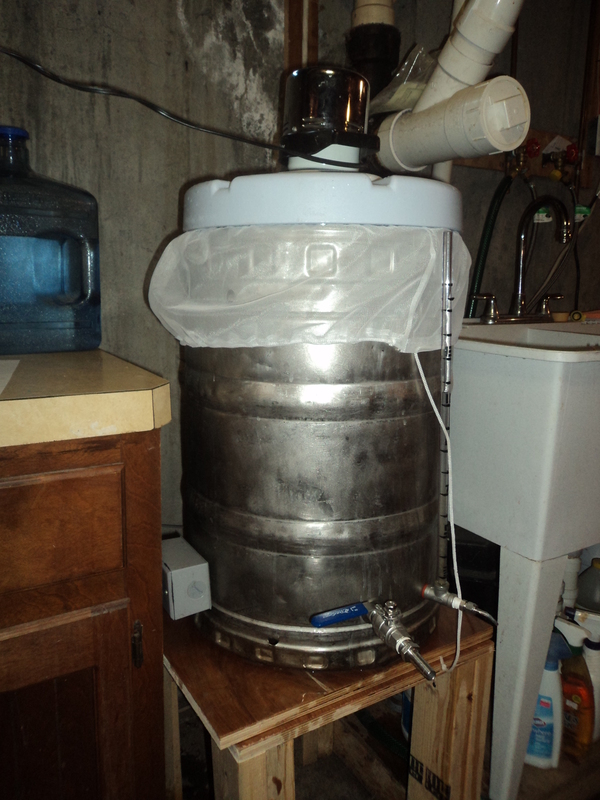 I use both the Brew in a Bag (BIAB) and batch sparging in a cooler brewing methods. 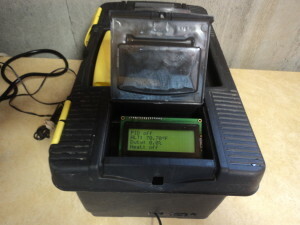 RasPiBrew is maintained by steve71. This page was generated by GitHub Pages using the Cayman theme by Jason Long.